Preheat oven to 400 degrees. Lightly oil muffin tins for 12 muffins. In a medium bowl, combine flours, baking powder, baking soda, cinnamon and nutmeg. In a separate bowl, combine sweet potatoes, brown sugar, eggs, orange juice, carrots and vanilla. Mix well. Add dry ingredients to liquid ingredients. Stir gently until flour is just moistened. Fill muffin tins 3/4 full. Bake 20 minutes or until tops are browned and bounce back when touched lightly in the center. Cool 5 minutes and loosen around the edge of each muffin to remove from tins. Cool completely then store in an air-tight container at room temperature. 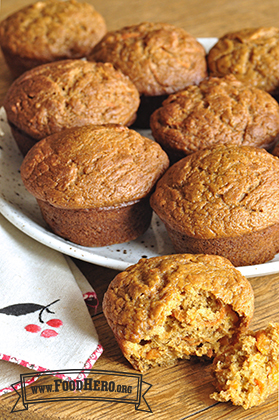 1 Comments for "Sweet Potato and Orange Muffins"
We recently revised this recipe to make only 12 muffins since that is the standard number of muffins in a muffin tin. This recipe does best when baked immediately after the batter is mixed. Enjoy!